Through stringent emphasis on creativity and originality, Continental Jewellery (Mfg) Ltd. achieves various design awards, white promoting and delivering excellence. 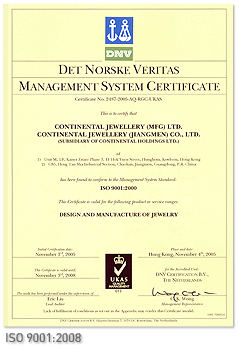 Acknowledgement of Continental Jewellery (Mfg) Ltd.'s commitment and accomplishments has come from a broad spectrum of organizations and publications. "A Grade Corporation" by Chinese Customs "Red List 2004"